This luxurious 3 bedroom Golf Villa is situated high on the hill above Secret Valley Golf Course with an open outlook to the surrounding mountains and to the sea. The property enjoys a quiet situation in a private location with nothing but green areas surrounding it, only a few minutes from the developments entrance. It is ideally situated to enjoy golf and the accompanying facilities (on 2 courses), local village life and the exploration of Paphos, Limassol and surrounding Troodos mountains. The main living accommodation of the villa is between 2 floors, with living room, dining area, kitchen and cloakroom downstairs and all 3 bedrooms, en-suite to master bedroom, family bathroom and a balcony with panoramic sea views upstairs. There are 4 single beds, 1 double bed, dining seating for 6 and lounge seating for 6. Outside there is a generously sized and private colourful garden (with loungers and furniture) surrounding a clear blue swimming pool, which also offers the facility of being heated for winter use to 24C for your leisure. A private driveway with gates leads to the front of the house where sun terraces provide shade and overlook the pool. A Car Port assists with keeping the car cool and protected in the heat of summer. Views to the Mediterranean and surrounding mountains can be found from most areas of the villa. 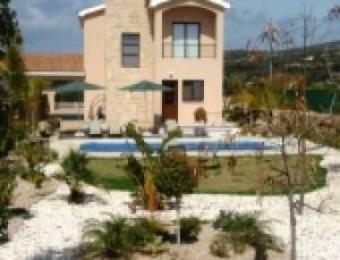 The villa is superbly kept throughout and very well maintained. Both the interior and exterior have been tastefully designed and finished in keeping with a development and villa of this stature. The villa is air-conditioned throughout. Modern furnishings, fittings, appliances and extras, BBQ, TV, SKY Satellite and Broadband wireless connection have been carefully planned and provided for a stress free, all taken care of lifestyle, where you can simply relax and enjoy the tranquil surroundings. Secret Valley (or as recently renamed `Venus Rock`), is a highly prestigious golf course located by the renowned area of `Aphrodite`s Rock`. It is set in a scenic valley surrounded by mature trees and beautiful natural rock formations. Consistently appearing as the preferred course amongst the island`s visiting players in terms of sheer playability and enjoyment Secret Valley really is a must for golfing enthusiasts worldwide. The popular villages of Pissouri and Kouklia are but a few minutes drive and the main towns of Paphos and Limassol can be reached in under half an hour. Local (not busy) beaches can easily be reached at Aphrodite`s Rock, Pissouri, Avdimou in one direction and Coral Bay and Lara in the other. Above Secret Valley itself, lies the road to the Troodos Mountains and Cedar Valley. The route is peppered with other small but charming villages along the way.